What do debates tell us about the candidates? Why are debates important? What do they tell us about the candidates? There have been great debates in American history. The Lincoln-Douglas debates of 1858 remain a shining example of sophisticated discussion. The two held seven debates across Illinois in their race for the Senate which focused mainly on the issue of slavery. One candidate spoke for 60 minutes, the other for 90 minutes, and then the first candidate had 30 minutes to reply. The presentations were edited and printed and remain outstanding examples of oratory skills. On the other hand, the first debates on television, the four Nixon-Kennedy debates for the presidential election of 1960, remain an example of a perverse television effect. If one listens to the first debate, watched by over 70 million viewers, Nixon had the better answers. If one watches the debate, the charm of Kennedy overwhelms the Republican who refused makeup and suffered from a gloomy image from his heavy stubble. All candidates since have realized the importance of looking good if not presidential. Are these debates relevant? Certainly in Parliaments like the House of Commons in England debating skills are important. Many British officials have been trained at institutions like the Oxford Union where debating competitions are judged. Indeed, in a traditional Anglo-Saxon education, debating is required. Are these skills relevant today? What skills are the candidates showing during debates to convince us to vote for them? More and more candidates in the United States look like movie stars. The elections of Arnold Schwarzenegger as Governor of California or Ronald Reagan as president have more to do with their theatrical abilities than political acumen. We may enjoy a politician's performance during a debate, but that does not necessarily mean the person will be a competent elected official. Preparing a budget, or working in a committee to prepare legislation is not the same as charming an audience. Discussions among heads of state have an element of charm, but presiding over a country requires skills not evident in campaign debates, as President Obama is surely finding out. I must admit I enjoy watching debates, but then again I enjoy being entertained at the theatre as well. In his bestselling book, Senator Barack Obama describes interacting with ordinary Illinois citizens in a series of town meetings. He writes: "And sometimes someone will grab my hand and tell me that they have great hopes for me, but that they are worried that Washington is going to change me and I will end up just like all the rest of the people in power. Please stay who you are, they will say to me. Please don't disappoint us." I'm not sure if the people of Illinois are disappointed by the performance of their Senator now President - the election in 2012 will give a clearer picture - but I am certain that the people in Palestine are disappointed by Barack Obama's speech at the United Nations. President Obama reiterated his recent position that the United States will veto any attempt to recognize Palestinian statehood in the U.N. Security Council. "Peace will not come through statements and resolutions at the U.N.," he said. Were the Palestinians justified in expecting more from President Obama? Flashback to his Cairo speech of June 4, 2009: "So let there be no doubt: the situation for the Palestinian people is intolerable. America will not turn our backs on the legitimate Palestinian aspiration for dignity, opportunity, and a state of their own." Flashback to his speech to the United Nations General Assembly of September 23, 2010: "We should reach for what's best within ourselves. If we do, when we come back here next year, we can have an agreement that will lead to a new member of the United Nations: an independent, sovereign state of Palestine, living in peace with Israel." The election of Barack Obama was an extraordinary moment in American history. Outside the United States as well, it raised enormous expectations. 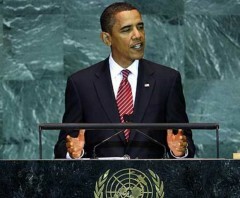 His speech in Cairo was a reaching out to the Muslim world following the divisions resulting from September 11. His message was received with the hope of those citizens in Illinois who attended his town meetings. The audacity of hope was for real change from the status quo, a real transformation from business as usual, including the realization of Palestinian statehood. In his words and person Barack Obama led many to believe that things would be different if he were elected president. For the people of Palestine there has been no change; negotiations between Israel and the PLO have stalled and there has been no movement on the promised statehood. When Barack Obama asks us to "reach for what's best within ourselves" he should do the same. The citizens of Illinois pleaded, "Please don't disappoint us". For the people of Palestine, he has done just that.